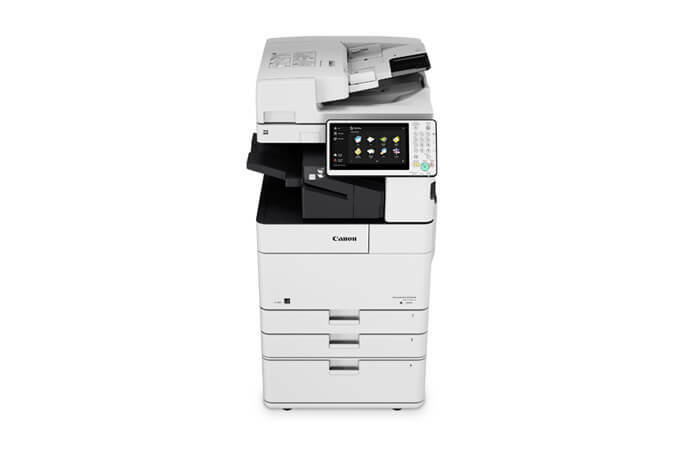 Combining reliable performance with an efficient and compact design, the imageRUNNER ADVANCE 4551i provides busy offices with a multifunction printer built to improve workflow. As part of the imageRUNNER ADVANCE line from Canon, this black and white printer performs seamlessly within fleet environments and offers an intuitive user experience. This all-in-one business solution is an outstanding choice for small to medium businesses, and departments within larger organizations. Cost-conscious environments, such as schools, government entities and hospitals, can also benefit from the many features of the imageRUNNER ADVANCE 4551i. The imageRUNNER ADVANCE 4551i offers printing speeds of up to 51 ppm in black and white and the ability to scan up to 160 ipm (300 dpi) in black and white or color through a single-pass duplexing document feeder. Several optional finishing features are available, including staple-free stapling, traditional stapling and hole-punching. This cost-efficient printer / copier / scanner is built upon the intelligent imageRUNNER ADVANCE platform and is designed to meet a range of business needs with an easy-to-operate and customizable user interface.